The contest is held in memory of the late John Moyle who was a long term editor of the Wireless Weekly, (later Radio & Hobbies – later Radio Television & Hobbies) magazine from 1947 until his untimely death in 1960. MOYLE served with distinction in the RAAF during the Second World War. He was responsible for a number of innovative solutions in keeping radio and radar equipment working under wartime operations and difficult working conditions. The WIA decided that a suitable long term memorial to John Moyle would be a Field Day with a focus on portable or field operation. The contest has been conducted annually ever since. When I awoke on Saturday morning, the weather was ‘lousy’ to say the least. In fact I was awoken by extremely heavy rain and strong winds. The weather had certainly broken. We had experienced a particularly hot summer here in the Adelaide Hills, with about 14 days of temperatures exceeding 40 degrees C. On one day the temperature reached a scorching 47 deg C. So as the weather was less than impressive, I wasn’t keen on heading up to Mount Barker summit for the start of the contest at 11.30 a.m. Instead I waited til later in the afternoon, and decided to participate in the 6 hour section. 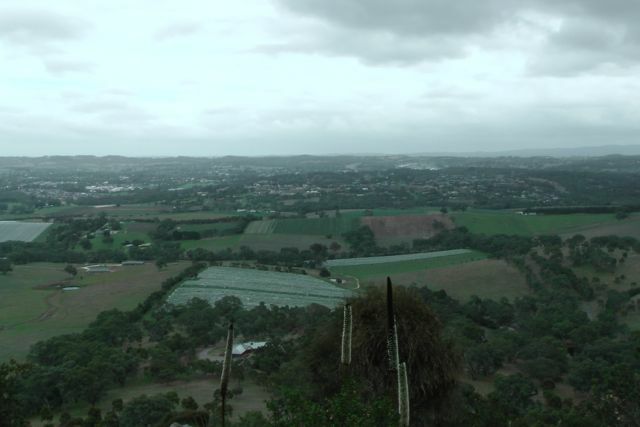 So at about 1.30 p.m. off I headed to Mount Barker summit, which is located just a short 5 km drive from home. 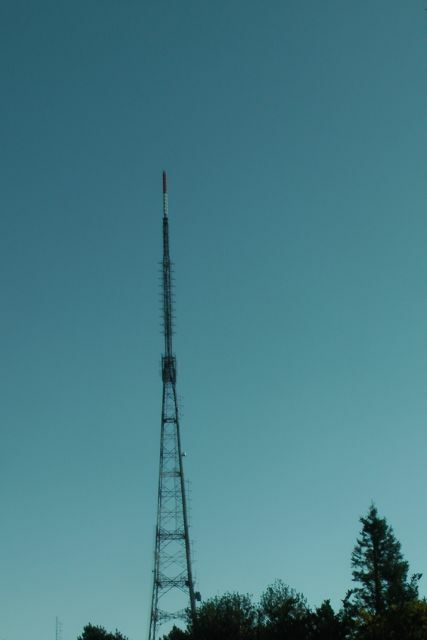 Mount Barker summit is about 517 metres ASL, and sadly does not qualify for the Summits on the AIr program (due to issues with 150 metres of prominence). 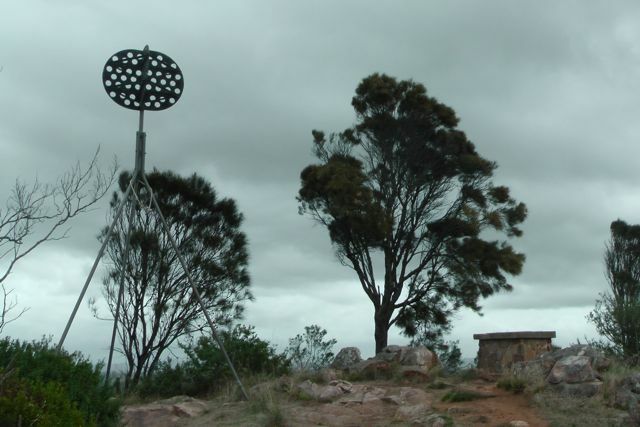 Despite this, the summit is an impressive feature in the Adelaide Hills, and there are spectacular views in all directions from the summit. Mount Barker summit was first sighted by Captain Charles Sturt in 1830. However, he believed that he was viewing the previously discovered, and much higher Mount Lofty summit which is located further to the west. Captain Collet Barker corrected this error, when he surveyed the Mount Barker area during 1831. Sturt went on to name the summit, Mount Barker, in honour of Cpt Collet Barker, who was killed just days later by local aboriginals. Although there is some slight contention, it is believed that the very first Europeans to climb the summit were a six man party on 27th November, 1837. The group consisted of John Barton Hack, John Morphett, Samuel Stephens, Charles Stuart, Thomas Davis, and John Wade. The nearby township of Mount Barker (where I live) has a number of streets and landmarks named in honour of many of this group. 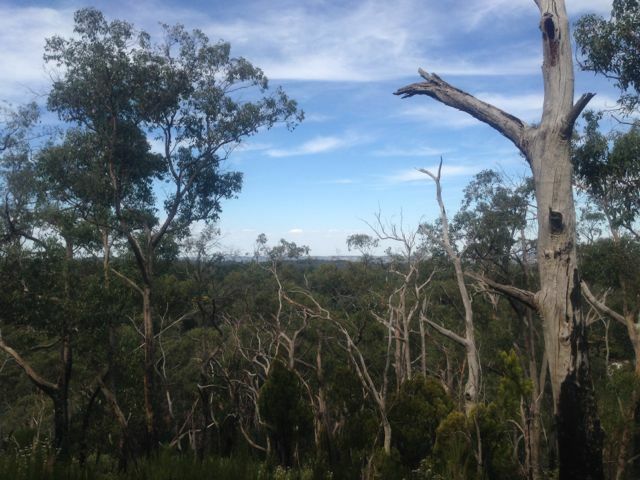 The summit is located within the Mount Barker Summit Conservation Reserve, which is 46.2 hectares in size. So, as a Conservation Reserve, it does not qualify for the VK5 National & Conservation Parks Award. There is a road leading all the way to the top of the summit, which can be reached off Summit Road. My ever reliable and keen wife Marija had offered to come along and help me set up the equipment. But justifiably so, did not want to stick around in the less than perfect weather. So we parked the car in the carpark, alongside the telecommunications tower, and walked a short distance up hill to the picnic area established by the Nairne Lions club. On the way up, we saw a variety of bird life (of the feathered variety), including Adelaide Rosellas, and New Holland Honeyeaters. 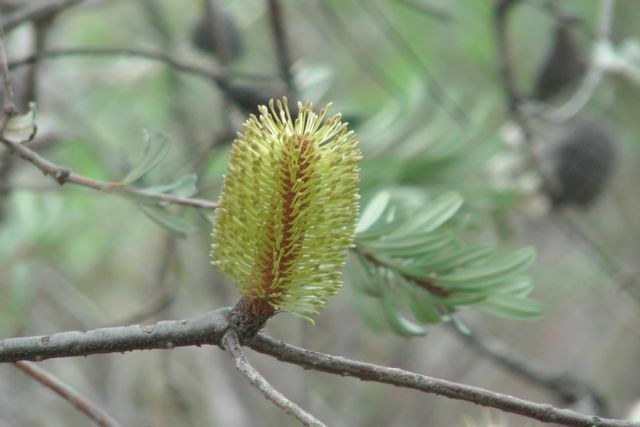 There were a variety of native plants in flower, including the banksias and correas. There has been a total of 28 plant species documented on the summit. Because the weather was ordinary, we quickly erected the tent and antenna, my 40m/20m linked dipole, supported on a 7 metre squid pole (inverted v). I then walked a further 50 metres up to the trig point and admired the view for a short time, while I could. 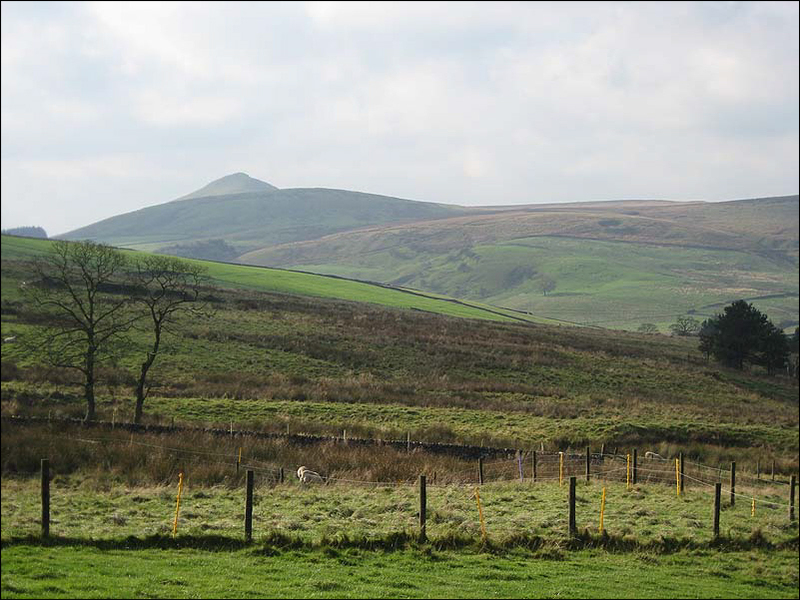 There is a trig point at the top, along with a directional cairn which was erected by the local council way back in 1966, the year after my birth. As mentioned previously, there are spectacular 360 degree views from the summit. On a clear day, and this was not, you can see all the way down to the south to the Coorong and Lake Alexandrina. 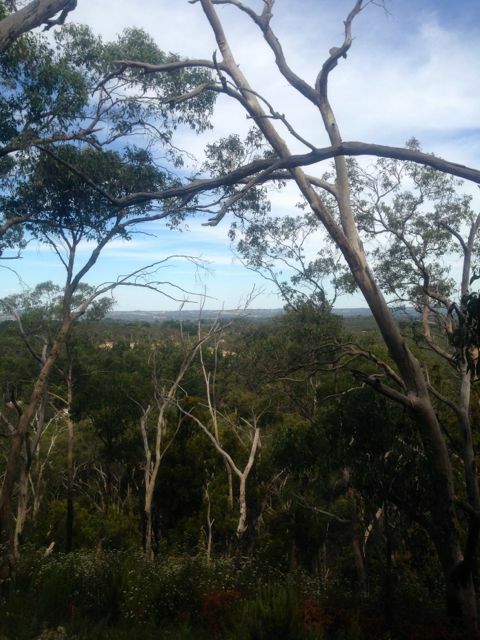 There are amazing views out to the west over the Mount Lofty Ranges and the ever increasing township of Mount Barker. So after some photographs, I headed back down to the ‘shack’ and continued to set up some gear. The weather was holding off, although it was very threatening out to the west. I initially set up on one of the wooden tables established at the summit by the local Nairne Lions Club. And I was visited by a local ham from nearby Hahndorf, who had heard me mention on 20m that I was heading up to the summit. 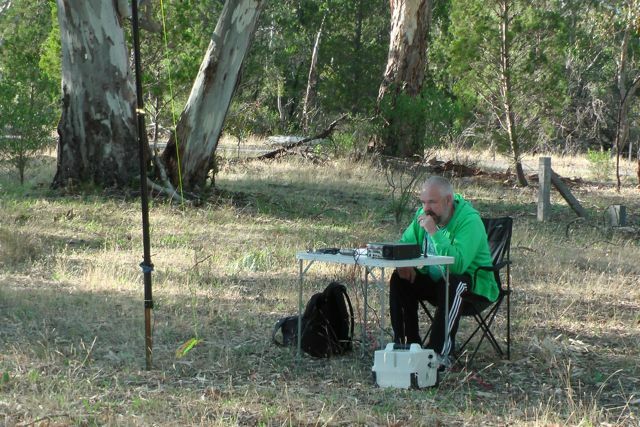 My first contact was at 0419 UTC (2.49 p.m. S.A. local time) with Jim VK5TR, who I know through the Adelaide Hills Amateur Radio Society. Jim had an incredibly strong signal coming in from the southern suburbs of Adelaide. This was followed by VK3ER, and then my old mate Roy VK7ROY. Despite the fact that it was still early in the afternoon, the 40m band appeared to be in quite good condition. However, my fun on 40m was soon spoiled by the weather which hadn’t stayed kind for very long at all. 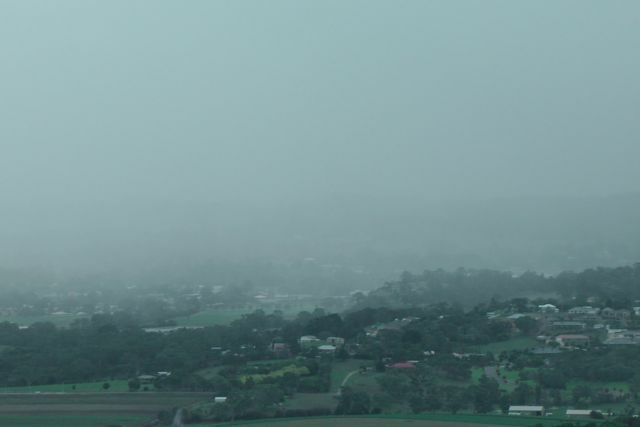 The summit was soon drenched in rain and struck by very strong and squally winds. So it was off to the protection of the tent, which somehow managed to survive the wind, which at times was extremely strong. I remained on 40m until about 0800 UTC (6.30 p.m.), when I decided to venture over to 20m ssb. My first contact was with VK6ARG, followed by VK4QD, and then special event station GB0BB in the United Kingdom. Whilst on 20m, I worked a little bit of DX from the United Kingdom, Russia, Italy, Germany, New Zealand, Slovenia. But the 20m band seemed to drop out a lot earlier than normal and there were not a lot of takers. So after the 20 m band dropped out, I headed back to 40m and started calling CQ, and worked a constant flow of callers from all over VK & over in ZL. The band was in very good shape, but I was fast approaching 9.00 p.m. which signalled the end of my 6 hours of operating time. I even started to get calls from the U.S.A. I started to think that I should have commenced operating later in the afternoon. I went QRT just before 9.00 p.m. and again with the help of my beautiful wife (who had driven up to collect me), we dismantled the antenna and tent, and packed up all the gear. In the rain too ! And then back to the car, and off to a nice warm bath and a bottle of red ! I ended up with 155 QSO’s in the 6 hour period, which I was a little disappointed with. But it was a lot of fun. This was my first time operating portable during the JMFD, and I will certainly be better prepared next year. I would like to thank the Mount Barker District Council, who gave me permission to operate from the top of the summit. The lower gate is normally locked at dusk and re opened at dawn. F5PAU; VK6ARG; VK4QD; GB0BB; RA3PCI; VK6SH; IK7YCE; VK1SV; DK4RM; G4RRA; G3OCA; G0RQL; VK6EH; VK2NSW; ZL2OPB; VK2DAG; VK2CL; VK4CPS; VK6ZN; S58AL; VK5ARG; VK2CBD. Below is a video of the activation…..
‘Mount Barker Summit Conservation Reserve Management Plan 2011’, prepared for the District Council of Mount Barker, T. Milne (2011), EAC-Ecological Evaluation Pty Ltd.
Late yesterday afternoon, my wife Marija and I headed over to the Onkaparinga River National Park. 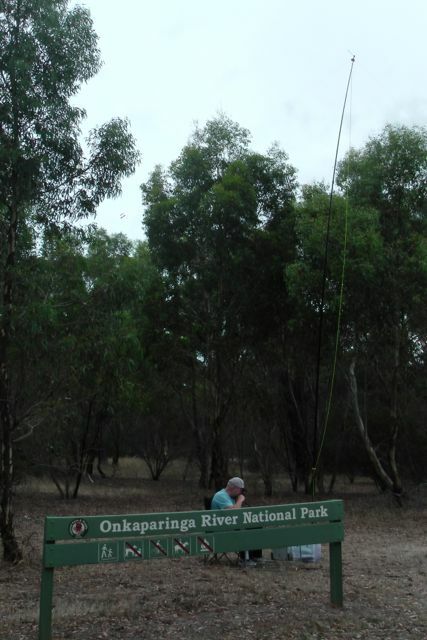 I had activated Onkaparinga River NP last year for both the VK5 National and Conservation Parks Award & WWFF, but I wanted to increase my tally of QSO’s up over 44 for the global WWFF award. I had only 10 QSO’s last time I activated this park in July 2013. Plus, this was a new calendar year, so the park was worth an extra 2 points for me for the VK5 Parks Award. Onkaparinga River NP is 1,544 hectares in size, and is one of South Australia’s largest parks. It is situated about 32 km south of Adelaide. 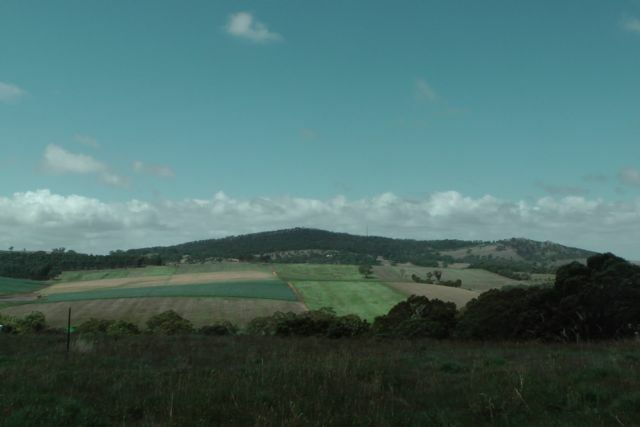 It is a beautiful 45 minute drive from my home, through the Adelaide Hills towns of Echunga, Meadows, and Kangarilla. 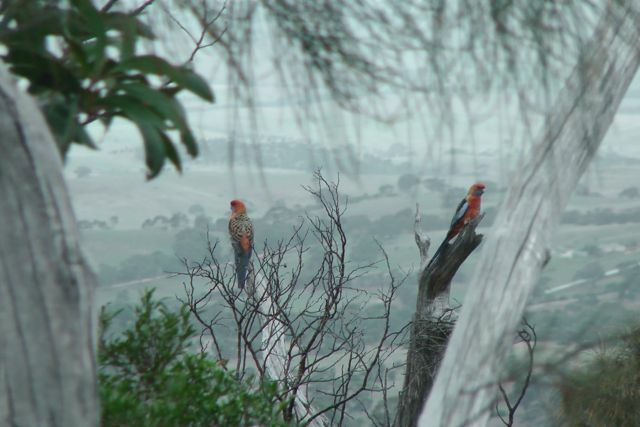 The park features rounded ridge tops, steep gorge slopes and the narrow river valley of the Onkaparinga Gorge. The gorge has been cut out slowly over many years by the Onkaparinga River. 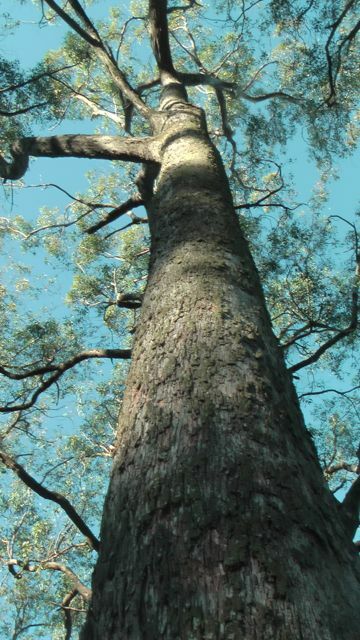 Within the gorge itself there are remnant woodlands of pink gum, mighty river red gum, grey box, sheoak, and native pine. There are also significant grasslands, all of which have survived 160 years of livestock grazing, harvesting of timber and cropping. There are over 180 bird species within the park. 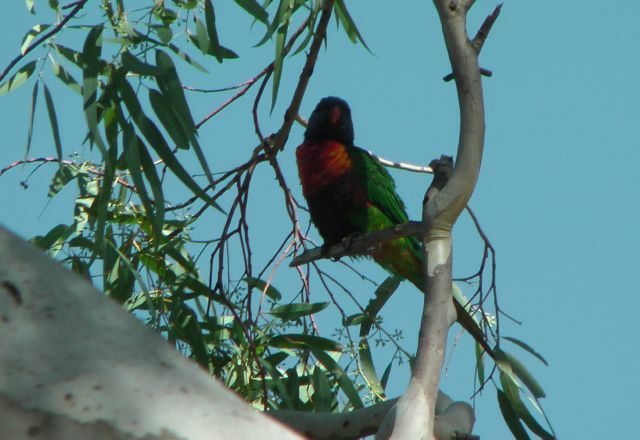 This includes Wedge Tailed eagles, Laughing Kookaburras, Sacred Kingfisher, and various lorikeets, rosellas, and parrots. Numerous Australian native animals can be found in the park including Western Grey kangaroos, koala, brush tail possums, and echidnas. As the sun started to go down, there was no shortage of kangaroos grazing in the open areas surrounding where I was set up. Rock climbing is a favourite past time in the park, as is canoeing or kayaking down the Onkaparinga River and the associated estuary channels. There are a number of well marked walking trails through the park. Marija and I accessed the park via Chapel Hill Road. The map below, shows our operating position (marked with the red arrow). 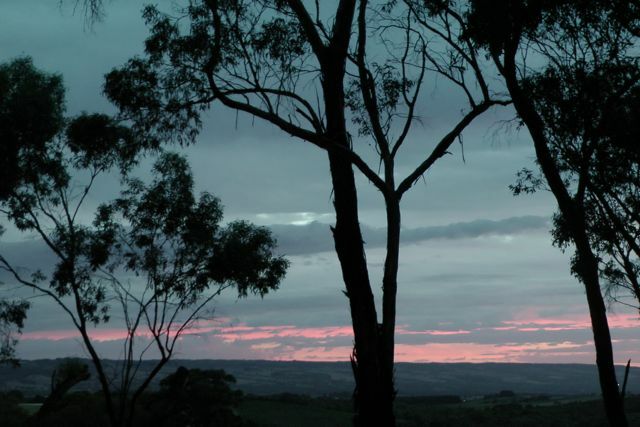 There are many fantastic wineries in this area as it is very close to the famous wine growing region of McLaren Vale. We found a good car parking area on Chapel Hill Road, and unloaded the equipment. We set up just inside the park boundary, right alongside one of the park signs. There was a good cleared area here, so I was able to stretch out the 40m / 20 m linked dipole, which I supported on my 7 m squid pole. I brought 2 radios with me for this activation. I had the little Yaesu FT-817nd for localAustralian contacts on 40m (running just 5 watts). And I had my much bigger Yaesu FT-450 for the DX on 20m (running 50 watts). After setting up my fold up table and deck chair and making myself comfortable, I tuned to 40m. Just as I was doing this, I received a text message from my friend, John VK5BJE, who was operating portable in the Mark Oliphant Conservation Park. This was an opportunity for a ‘Park to Park’ contact for the VK5 Parks Award. So I quickly tuned to 7.100 and spoke to John who had a beautiful strong 5/8 signal. I then saw a spot on SOTAWatch for Kevin VK3KAB/p who was portable on SOTA peak, Hyde Hill VK3/ VC-008 on 7.110. I called Kevin who has a lovely 5/8 signal (5/8 signal report received back from my qrp set up). I then headed up to 7.144 and called CQ and was greeted by the masses of Park Hunters. First cab off the rank was Rod VK5VRB, followed by John VK2AWJ, then Brian VK5FMID, and then Ben VK3WRL. A steady flow of callers followed from VK3 & VK5. All with very nice signals. It appeared that the 40m band was in good shape. A few guys called me whilst running QRP. They including Doc VK5BUG using just 3 watts, and Col VK5HCF down in Mount Gambier, 400 km away. 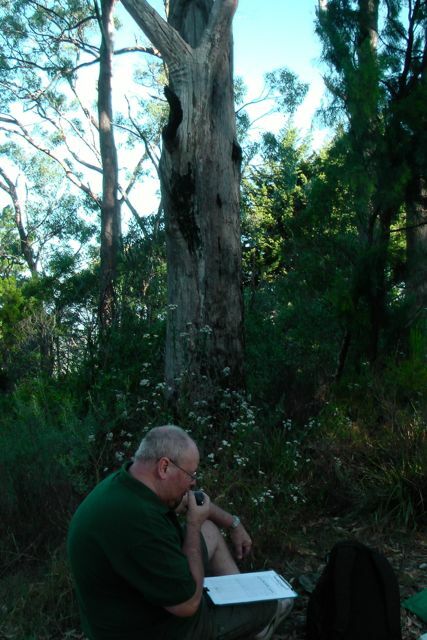 I also worked Tony VK3CAT who gave me a call whilst he was on SOTA peak, Mount Macedon VK3/ VC-007. Tony was a good strong 5/8 and I received a 5/9 signal report from Tony. Tony had a slight accident with his thermos while we had our QSO, which put a bit of smile on my face. Sorry Tony ! Sadly, some VK2’s came up just 2 kc away from me, which made things very very difficult. I am sure they could hear me. Other VK2’s were. It was their daily net, and I guess they were’nt going to move for anyone. Sadly, this seems to be a common problem with some operators. When things started to slow down on 40m, I lowered down the antenna and unclipped the alligator clips so I could operate on 20m. I was keen to work some DX from the park. I had been inspired by Tony VK3VTH and Peter VK3ZPF, who are both keen park activators for both WWFF and also the Keith Roget Memorial National Parks Award (KRMNPA). In recent times both Tony & Peter have been working huge amounts of DX during their park activations. So after setting up the dipole for 20m, I saw a spot on SOTAWatch for Mike 2E0YYY, who was sitting on top of SOTA peak, Gun G/SP-013. There was a huge amount of QRM from nearby stations, but despite this, Mike was a very good signal into the park. I called a few times and managed to get through to Mike (4/5 sent and 5/5 received). It was great to work Mike. He was my first ever SOTA contact 3 years ago. After working Mike I headed off to 14.244, but there was a lot of interference from nearby stations, so I went down slightly lower to 14.243 and put out a CQ call, to be answered by DK4RM. My old mate Peter VK4AAV then called in to say hi. Peter was kind enough to place me on the DX cluster, and that is when everything went mad. What followed was a huge pile up from Europe and the United Kingdom. It got so busy, that I almost had to go split operation. I ended up with a total of 84 QSO’s on 20m ssb. Of those, 73 were DX contacts in England, Germany, Belgium, Spain, Austia, Russia, Ukraine, France, Romania, Italy, Switzerland, Denmark, Czech Republic, Hungary, USA, Slovenia, Belarus, Poland, Baeleric Islands, Finland, Japan, Slovak Republic, and Ireland. There were some very interesting contacts amongst this. They included Geni OE7DXT who was mobile and had a beautiful 5/7 signal amongst the pile up. Tom G0SBW who was pedestrian mobile and QRP with a nice 5/4 signal. Rich G0OWU who was QRP with 10 watts and had a nice 5/7 signal. I was also called by Peter ON2WAB/p who was portable in ONFF-370, Meetjeslandse Kreken. It was a little bit of a struggle with Peter who had a 4/4 signal but we made it. Peter gave me a 5/5. And I was also called by Jef DD2CW who was portable in DLFF-039, Augsburg-Westliche Wälder. My very good mate Bill W1OW from Massachusetts USA also came up to say hi amongst the pile up. Thankyou to Peter VK3CFA for letting me know he was there. I would later work Bill on 40m SSB as well. And an interesting call came from Fuji, 7K1PAS. It was really great to speak to Fuji, who was my only Asian contact, and with the same suffix as my call sign. Thanks Fuji. I would like to say a big thank you to Andrew VK2UZ. During the pile up I was working, I started to get some bleed over from just above me. I went up 2 kc and spoke to Andrew & the G station he was working, and they both graciously QSY’d up a little higher. Thanks guys for your courtesy. Sadly the same cannot be said for a ZL who subsequently came up just 2 kc away and totally killed the frequency. I apologise to all the Europeans who were still calling. I just could not fight off the ZL’s huge signal. When the 20m band started to close, I headed back to 40m and I booked in to the 7.130 DX Net for about 20 minutes and worked a further 10 stations in VK2, VK4, VK6, VK7, New Zealand, USA, and French Polynesia. 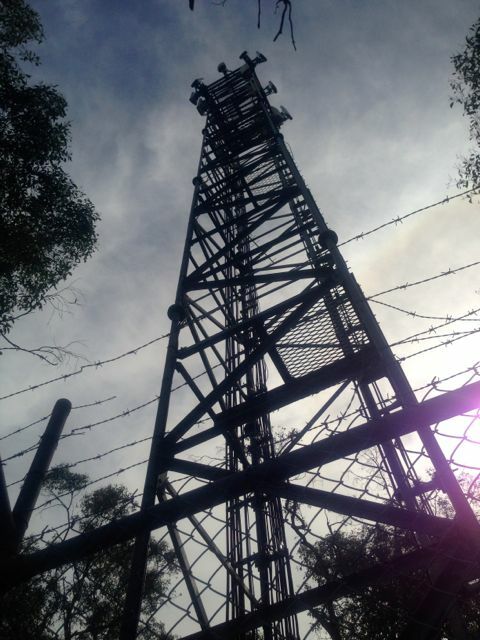 This included a contact with Doug VK2FMIA/p was portable in Warrabah National Park, VKFF-518. Also a QSO with Wayne VK5LWR/p who was portable in the Deep Creek Conservation Park (with a 5/9 plus 20 db signal). But it was starting to get late, and I had pushed my luck far enough with my XYL, so it was time to pack up and head home. I had managed a total of 120 QSO’s on 40m ssb and 20m ssb. Of those, 73 were DX contacts on 20m SSB. And 4 DX QSO’s on 40m ssb. This was a really enjoyable and very exciting activation. VK5BJE/p (Park); VK3KAB/p (SOTA); VK5VRB; VK2AWJ; VK5FMID; VK3WRL; VK5EMI; VK5KGP; VK5FBAC; VK5WG; VK5NQP; VK5FAKV; VK5BUG/qrp; VK3ZPF; VK5HCF/qrp; VK3HJ/m; VK5BJE; VK3FABE; VK5JDS; VK3VEK; VK3GMM; VK5AV; VK5MPJ; VK3CAT/p (SOTA); VK3ERW; VK3AMB; VK7ROY; FO5JV; W1OW; VK2FMIA/p (Park); VK7CC; ZL2ASH; ZL2TCR; VK4FAAS; VK5LWR/p (Park); and VK6FNKS. 2E0YYY/p (SOTA); DK4RM; VK4AAV; VK6JES; ON5JE; EA4DTV; OE8TLK; UA4PKN; UT5PI; ON5JK; F1RUK; YO3JW; I5FLN; IK2AHU; OE7DXT/m; F5PAU; HB9FLU; OZ7KIM; IZ2GTO; ON5SY; OK2APY; ON4BB; HA0LG; UA9LT; IW2NXI; RA1OD; VK5VRB; DF6EX; OZ4RT; DK3GG; M0WYZ; IZ5ILF; RN3B; DL1EBR; IK2VUC; S52KM; DL1NAX; OK2PAU; R7AY; EV1R; F4HDR; HA8IE; OP7M; DL2ND; RA3PCI; DH1UQ; G0SBW/pm; ON7ZM; OH6RP; DL5XU; SQ9JYK; EA6XQ; ON6YH; US2WU; G4NIF; SP6KEP; I5RMY; S58AL; G0OWU/qrp; IZ2ZQP; VK3NCC/2; OH6JE; SM6CNX; ON2WAB/p (ONFF-370); RD4HZ; OH6IU; DD2CW/p (DLFF-039); VK5ZKT; G0BPK; M0LBJ; G0AWY; VK3CFA; W1OW; 7K1PAS; OM1AX; OM7OM; VK4KDX; G3UUV; VK5MPJ; VK3SX; VK7PSJ; EI4IT; VK6NTE; and EA7BA. 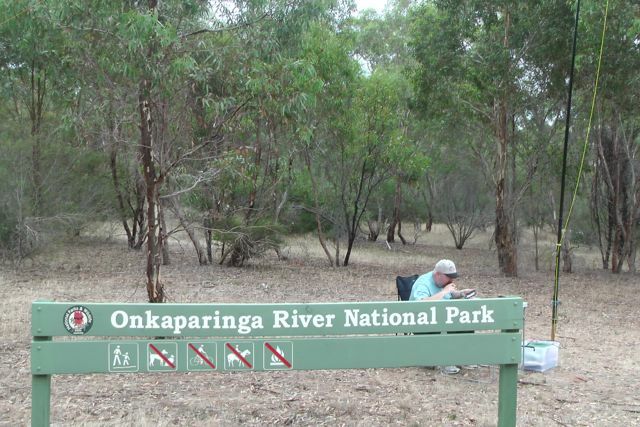 ‘Onkaparinga River National and Recreation Parks’, Department of Environment and Natural Resources, June 2010. 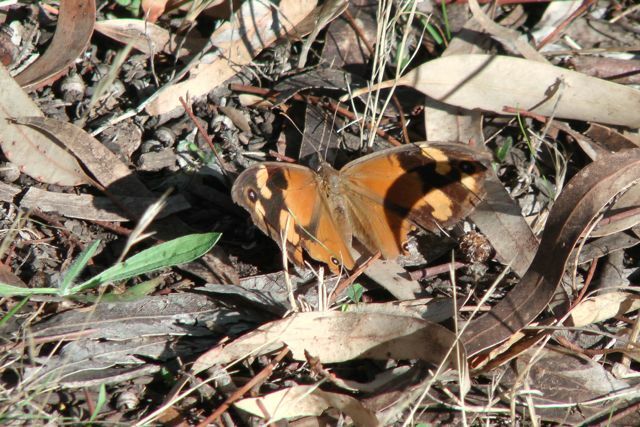 Friends of Onkaparinga Park Inc, http://www.communitywebs.org/OnkaparingaParks/. 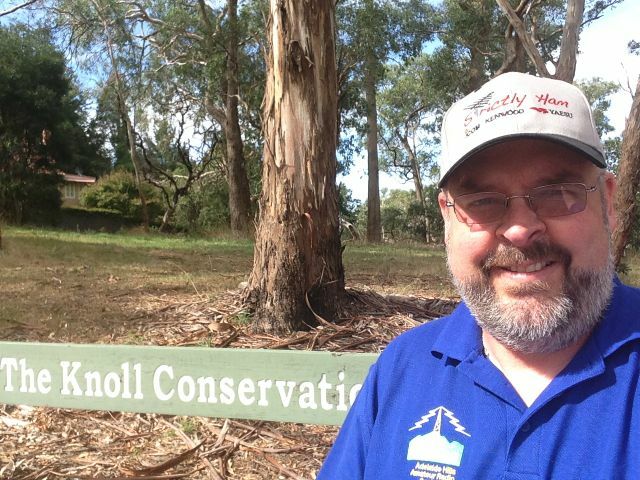 On the way home from the VK5 SOTA & Parks symposium, Larry VK5LY and I stopped off at The Knoll Conservation Park, which is located at Crafers West in the ‘Adelaide Hills’ Mount Lofty Ranges. 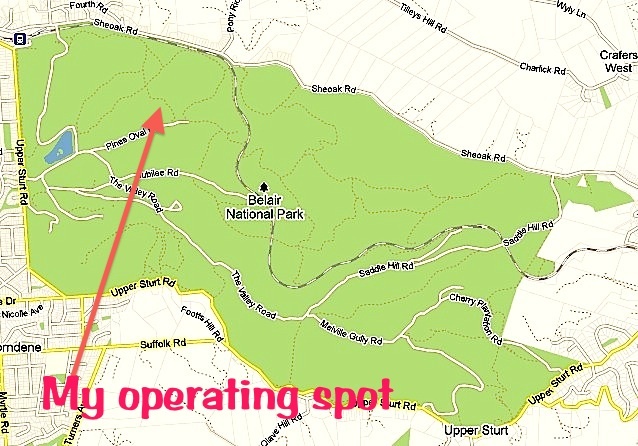 Before leaving the BBQ, the 2 ‘eager beavers’ Nigel VK5NIG & Stu VK5STU had mentioned they were going to whizz over to Mount Lofty summit which is located within the Cleland Conservation Park, and do a dual SOTA/Parks activation. So, Larry and I did not need any prompting. I activated The Knoll CP last year, but because it was a new calendar year, this activation was another point for me. And this was a unique / new park for Larry. The Knoll CP is a beautiful little Conservation Park, which I am sure most people don’t even know about. The entrance is off Waverley Ridge Road, directly opposite Sheoak Road, and the start of busy Upper Sturt Road. I am sure that most people drive passed this park quickly and don’t even know it’s there. There is a small carpark on the eastern side of Waverly Ridge Road, so we parked Larry’s car there and unpacked the gear. Larry and I then walked up the slight hill to the tower installation in the park, and set up just on the southern side of the tower and associated infrastructure. We couldnt venture too far into the park, because we were wearing ‘Japanese safety boots’ (thongs), and there is a large amount of leaf litter and debris on the ground within this park. We didn’t fancy a chance encounter with a snake ! 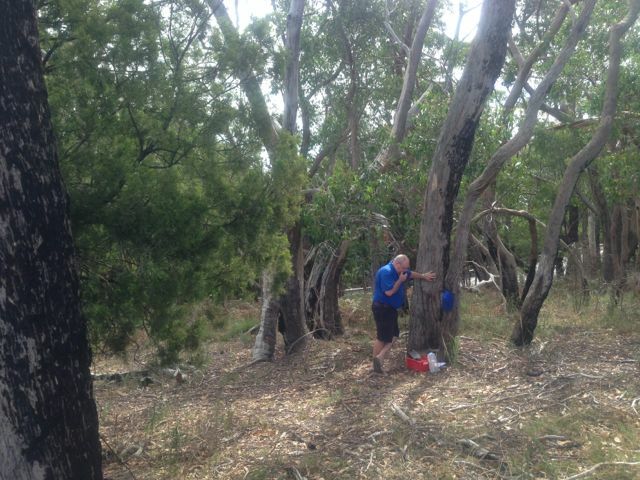 We set up Larry’s home brew linked dipole and Yaesu FT-817, and found ourselves some shade from the very hot sun, under a large gum tree. We then tuned to 7.095 on 40m ssb. 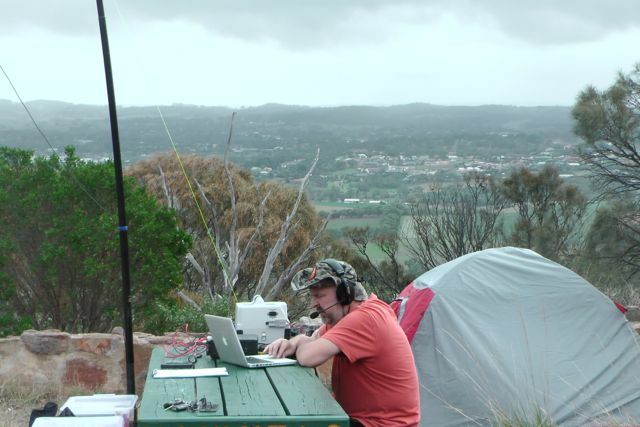 Our first QSO’s were with Stu & Nigel on the top of Mount Lofty. They answered Larry’s first CQ call. Stu and Nigel were only about 3 km away from us, so it was no surprise that their signal/s were very strong. That was a great start. A SOTA contact and a Park to Park contact for the VK5 National & Conservation Parks Award. Larry kept calling CQ and got a few Park Hunters, but it was very quiet on the band. 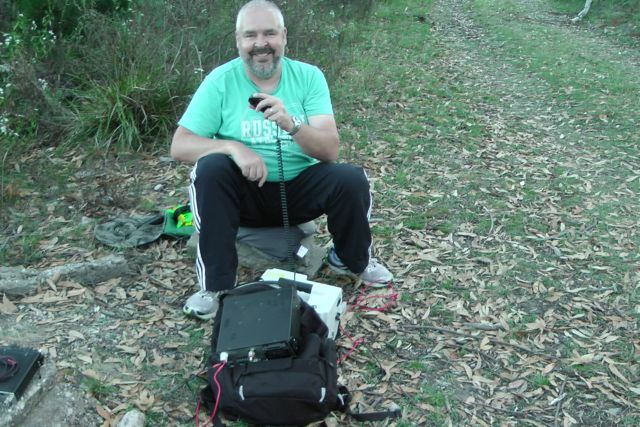 Trevor VK5TW called in, followed by Phil VK3BHR with a nice signal. 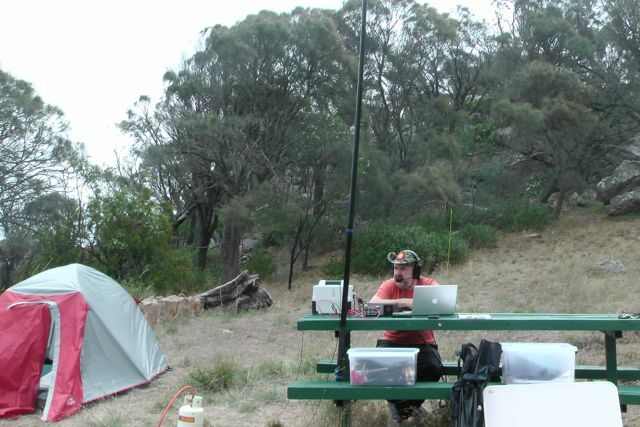 Nick VK3ANL/p who was portable on SOTA summit Mount Ida VK3/ VU-009 and within Heathcote-Graytown National Park VKFF-624 then gave us a call. Another SOTA peak, and a WWFF park. But that was about it…..it was very quiet. So we checked the radio and found that we had the 817 on the 2.5 watt setting. 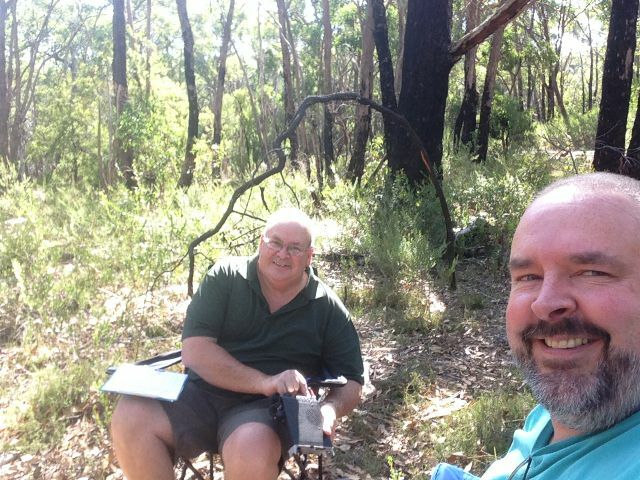 Larry and I then bumped up the power to a mighty 5 watts and were called by ‘the voice of the mid north’ Nev VK5WG, followed by Peter VK3PF. So after many minutes of calling CQ with no takers, Larry and I tuned across the band and found Tony VK3VTH/p. Tony was in Cobbobonnee National Park for the Keith Roget Memorial National Parks Award & WWFF (VKFF-728). Tony had a very strong 5/9 signal. We then ventured back to 7.095 and put a few calls out and were greeted by Brian VK5FMID; Tim VK5AV, Peter VK5KET, and Amanda VK3FQSO. Peter was running QRP 5 watts, using his FT-817 from home. It was starting to get very hot, and we were heading out for tea, that night, so we packed up and headed home, with another park activation under our belt. Stu VK5STU/p (SOTA); Nigel VK5NIG/p (SOTA); Phil VK3BHR; Nick VK3ANL/p (National Park); Nev VK5WG; Peter VK3PF; Tony VK3VTH/p (National Park); Brian VK5FMID; Tim VK5AV; Andrew VK5KET/p; Amanda VK3FQSO; and Trevor VK5TW. 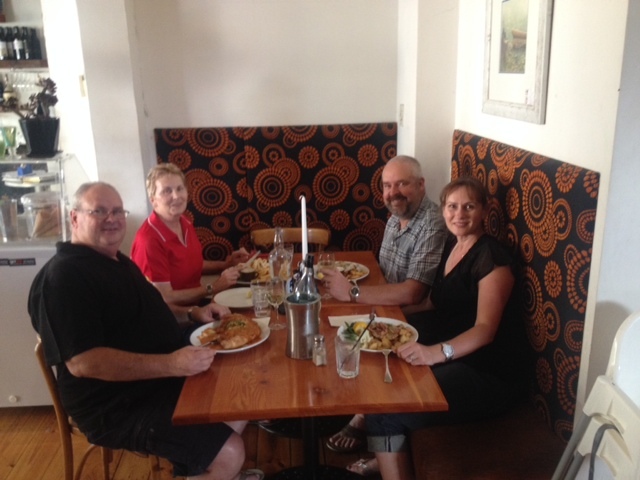 That night, my wife Marija and I, and Larry and his wife Di, enjoyed a very nice meal and some fine wine at one of our local restaurants ‘Nonna’s’ at Mount Barker. 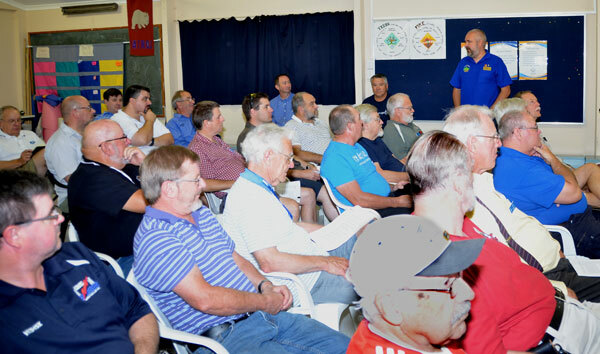 On Sunday 9th March, 2014, the inaugural VK5 SOTA & Parks symposium was held at the Guides Hall at the location of the Adelaide Hills Amateur Radio Club (AHARS) clubrooms at Blackwood. A total of 32 people attended the symposium. The pleasing aspect was that the majority of those attending had never activated a SOTA peak nor a National or Conservation Park. The day kicked off at 9.00 a.m. with a welcome by Tony VK5KAT, the President of AHARS. The four pre morning tea presentations were as follows…..
We enjoyed a morning tea break, and then further 5 presentations as follows….. Following the presentations, there was a 20 minute question and answer session, and this was followed by the closure of the symposium by Tony VK5KAT. We all then enjoyed a BBQ, kindly cooked by David VK5KC and Nigel VK5NIG. Great job fellas. I would like to say THANKYOU to the following, for helping me in preparing this successful day…..
David VK5KC & Roy VK5NRG & others (for setting up the hall). the presenters…Ian VK5CZ, Nigel VK5NIG, Stu VK5STU, Larry VK5LY, & John VK5BJE. Special thanks to Ian VK5CZ for travelling from Clare, and Larry VK5LY for travelling from Renmark. John VK5EMI for the photographs. My wife Marija, for shopping for morning tea & the BBQ. And thank you to everyone that attended. There was so much interest, that this is going to become an annual event. Next year, we will most likely hold talks in both the AHARS clubrooms & the Guides Hall. In the AHARS clubrooms we will have talks on the very basics of SOTA and the Parks Awards (for the beginners), and in the Guides Hall, we will have more specific presentations on a variety of topics. After our little activation at the Belair National Park, Larry VK5LY and I headed over to the nearby Mount Lofty summit. I have activated Mt Lofty many times before as it is very close to my home, but this was Larry’s first time to Mt Lofty, which is also located within the Cleland Conservation Park. So this was a ‘double whammy’ activation for both SOTA & the VK5 National and Conservation Parks Award. 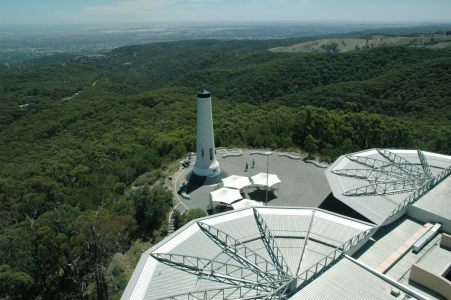 Mount Lofty is 727 metres ASL and is worth 4 SOTA points. Mount Lofty summit is located in the Mount Lofty Ranges ‘Adelaide Hills’, and is just a 20 minute drive from the city of Adelaide. Each year more than 350,000 people visit the summit to enjoy the breathtaking and panoramic views of the city of Adelaide. There is a restaurant and a cafe at the summit, and also a visitor information centre. Mount Lofty was first climbed by a European, when in April 1831, explorer Collet Barker climbed the peak. This was almost seven years before the city of Adelaide was settled. The summit was named by the famous explorer, Matthew Flinders, on the 23rd February 1802, during his circumnavigation of Australia. View of the city of Adelaide from the summit (Photo courtesy of WIkipedia). We set up in my favourite spot on the eastern side of the summit, away from all the tourists at the restaurant and the lookout. It can be really busy there. 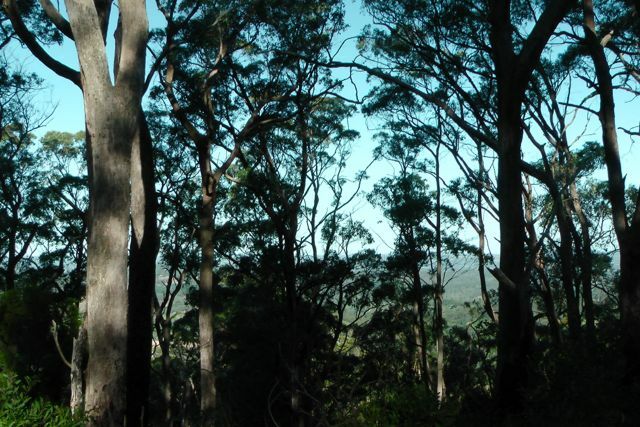 The advantage of the eastern side of the summit is that there is also a lot of shade under the tall gum trees. And it was a warm afternoon, with the temperature reaching 35 degrees C, and any shade was appreciated. We set up my 40m/20m linked dipole, inverted vee, using the 7 metre squid pole. Larry and I brought 2 radios with us for this activation. The Yaesu FT-817nd for the local contacts on 40m (running QRP 5 watts), and the bigger Yaesu FT-450 with a bit more power (running 30 watts), for trying our luck on 20m with the DX. But with the FT-450, also came the heavier load. Because this is an easy summit, it was not so taxing, but still involved lugging the extra kg’s into the activation zone. Nethermind, both Larry and I agreed that we needed the exercise. Larry started off on 40m on 7.090, and was soon welcomed with a pile up. 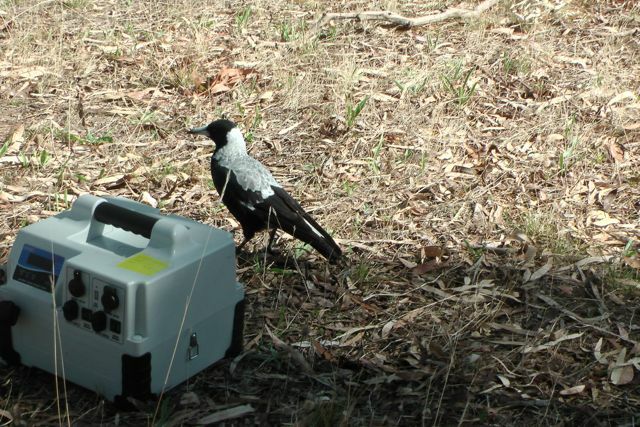 Larry’s first contact was with Richard VK5ZRY who was still portable in the Ramsay-Way Conservation Park on the Yorke Peninsula. This was a great start to get a ‘park to park’ contact for the VK5 Parks Award. Many of the ‘normal suspects’ called in from VK1, VK2, VK3, VK4, and VK5, to say ‘g’day’ to Larry. Conditions were very good, with excellent signals from all parts of the country. 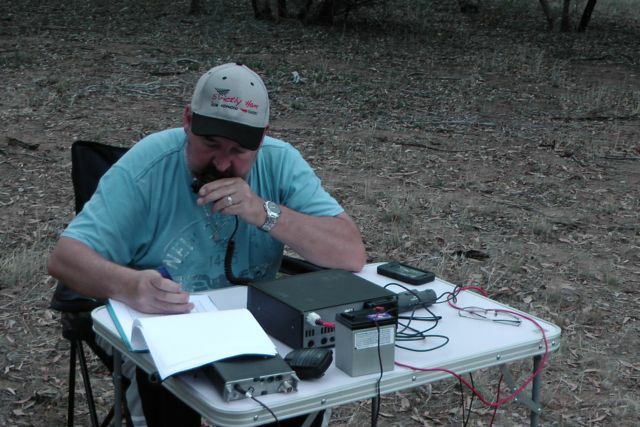 We also worked a Summit to Summit with Doug VK2FMIA, who was portable on VK2/ NT-008. This is an un named summit in the Northern Tabelands region of New South Wales. The summit is 1,456 metres and is worth 10 SOTA points. Doug (who is a very keen Parks activator) had a very nice 5/6 signal coming in to Mount Lofty. Larry’s backside was starting to get numb, and he wanted to stretch his legs. So this was a good opportunity for us to swap operators, and to venture over to 20m. We saw a SOTAWatch spot for Klaus DF2GN, who was portable on a summit in Germany. In fact Klaus was sitting on the top of Rainen DM/BW-042. Both Larry and I worked Klaus (a genuine 5/9 both ways). Klaus’ signal was very strong all the way from Germany to the Adelaide Hills. This was Larry’s first ever DX summit to summit. 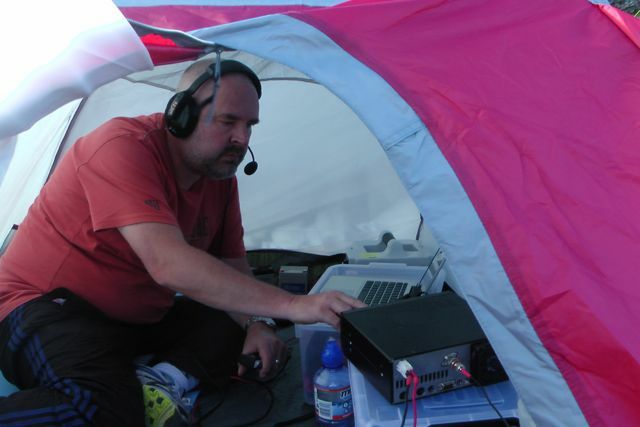 I also worked Klaus and this was another first….my first ever DX summit to summit. Larry and I were both very excited about this contact. Rainen is 1,006 metres above sea level and is worth 10 SOTA points. It is located in the Bathe Wuerttemberg region of the Low Mountains German Association. It is near the little village of Schomberg. We then chose a quiet spot on 20m and started to call CQ. I say ‘quiet’, but it didn’t stay like that for long. The 20m band was very busy, and it was only within a minute or 2, and we were getting QRM from nearby stations. However, not much we could do, and we continued to battle on calling CQ. 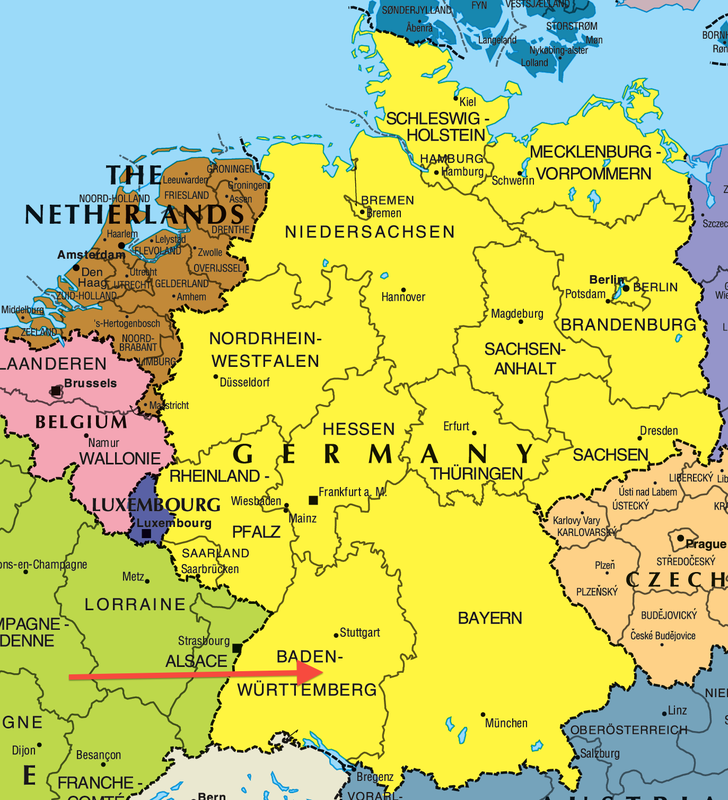 We soon got a pile up going from Europe & the UK and worked stations in England, Germany, Spain, Belgium, Austria, Slovak Republic, and the Czech Republic. We were also called by Gerard VK2IO who was mobile with a very strong 5/9 signal. Other VK’s to call in included Matt VK2DAG, Andrew VK2UH, and John VK6NU in Western Australia. It is always nice to get a VK6 in the log, because they are a long way away from the rest of Australia. For anyone reading this outside of Australia, it is nearly 4,000 km from Perth in the west, to Sydney in the east. Larry and I then saw a spot for Mike 2E0YYY, who was portable on Shining Tor G/SP-004 (559m ASL & 2 SOTA points). 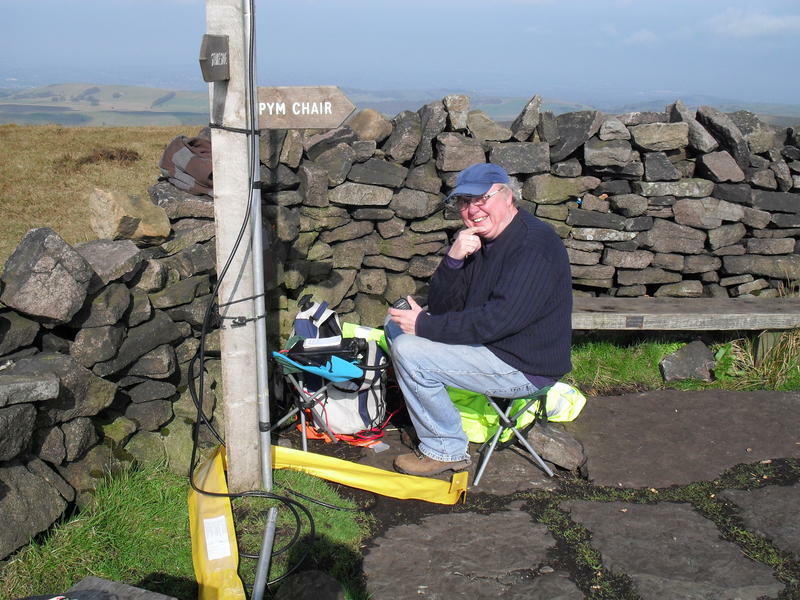 Mike was my very first ever SOTA contact a few years ago, so I was very keen to work Mike. I had spoken to Mike a number of times whilst he was on a summit. But that was while I was at home. Never whilst I was sitting on the top of a summit. So Larry and I headed off to 14.328 and there was Mike, with a nice 5/6 signal. We gave him a call and got through first time, with a 5/5 signal report being returned by Mike. Whilst operating we had a few interested onlookers. Some of those were even brave enough to approach us, to find out what we were up to. This included a couple of British tourists who were extremely interested to hear that we were working all the way back to their homeland. We also had a young lady out bushwalking with her children, and they were very interested in what these 2 strange guys were doing in the bush with a squid pole and talking strange lingo. It is always pleasing to have a chat to people and passing on information to them on this unique and very interesting hobby. After working Mike 2E0YYY, we ventured to 14.323 and called CQ again, working a further 12 DX stations in the USA, England, Italy, Switzerland, Spain, Germany, and the Netherlands. And not forgetting Paul VK2KTT who was a very strong signal. It was starting to get a bit late, heading towards 7.00 p.m. local time, and we had strict orders from our wives to be home by 7.30 p.m. for dinner. Yes, we are good husbands !! It was very frustrating, because we still had European & UK stations calling us. But it was time to pack up and head home to the girls, a few bottles of red, and home made lasagne. Larry and I had a total of 55 QSO’s in the log, including 2 S2S DX, and 31 DX contacts into the USA, Europe, & UK. Richard VK5ZRY/p; Doug VK2FMIA/p; Klaus DF2GN (summit to summit); G6TUH; VK2DAG; VK2UH; VK6NU; G0RQL; G4UXH; VK2IO/m, DL1DVE; EA2CKX; EB2CZF; EA2IF; EA2DT; ON5SWA; OE7FMH; OM1AX; ON2JF; OK1SDE; OE7WGT; 2E0YYY/p; KD7FMC; G6LUZ; G4OBK; G3XQE; IK1GPG; M6NNA; HB9MKV; EA2LU; DL3JPN; G0LGS; EB2JU; PA0SKP; VK2KTT; and EA4GJT. 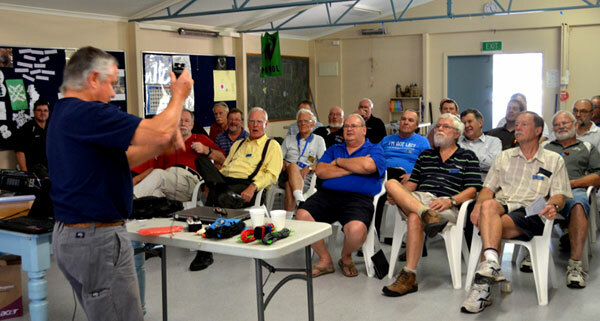 On Sunday, 9th March 2014, the first VK5 SOTA & Parks symposium was held at the Adelaide Hills Amateur Radio Society clubrooms. And Larry VK5LY from Renmark in the Riverland, was one of the guest speakers. So it had been arranged that Larry and his lovely wife Di, would be guests at our house on Saturday & Sunday nights. Larry & Di arrived at home on Saturday afternoon, and while the girls went shopping, Larry & I headed back out again to Belair National Park (I had been there earlier in the day). Larry had not activated this park before and was looking to qualify it for both the VK5 Parks Award and for WWFF. This time I headed for Sheoak Road at Crafers, which is a higher part of park, and we entered the park at Waverley Lodge. 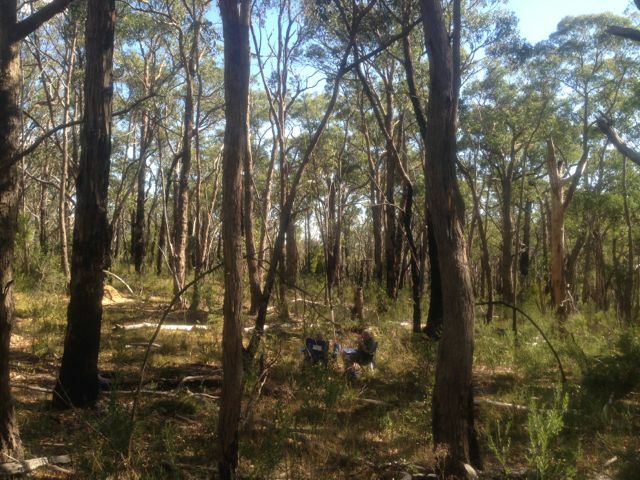 Larry and I walked down the track a short distance and set up in the bush under some large gum trees. It was a warm day, approaching 35 degrees C. We used my 40m/20m linked dipole and Yaesu FT-817 on the 5 watt setting. Because I had activated the park earlier in the day, I sat back and relaxed in the deck chair in the shade, while Larry played on the radio. Larry’s first contact with with Gerry VK5NMG at beautiful Moonta Bay. This was followed by Richard VK5ZRY near Port Vincent on the Yorke Peninsula. Richard told us that he would head over to the Ramsay-Way Conservation Park, just a short distance from home and give us a call. 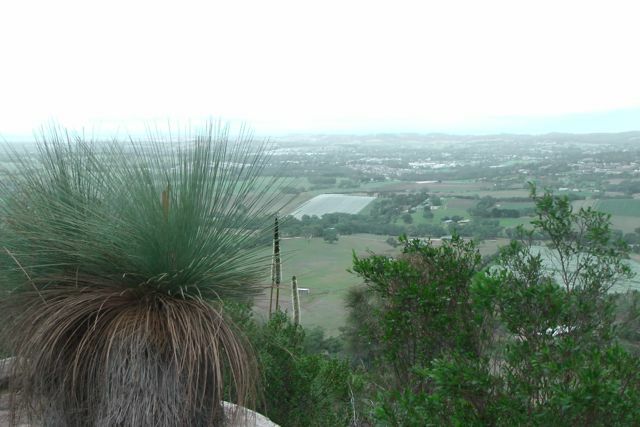 In fact, Richard advised that he had previously owned the land that this Conservation Park is located on, but had sold it to the Government to be declared as a CP. I found this to be really interesting, with Richard explaining to us some history of the park. I had activated Ramsay-Way CP last year for the VK5 Parks anniversary weekend. Again, the band seemed to be in very good shape, but it was hard going to fill out the log with very little activity. Larry & I spent about an hour in the park and managed to get 11 contacts. Anyway, we were happy with this. We had achieved a park to Park with Richard, and Larry had got his quota of 10 QSO’s, so he had qualified the park for the VKFF award. We decided to head over to nearby Mount Lofty summit and Cleland Conservation Park. Gerry VK5NMG; Richard VK5ZRY; Ian VK5IS; David VK5LSB; David VK5KC; Peter VK5KPR; Andy VK5LA; Ron VK5VH; Richard Vk5ZRY/p; and Nigel VK5NIG. On Saturday morning, 8th March, 2014, I headed over to the Belair National Park, to do an activation for both the VK5 Parks Award and WWFF. 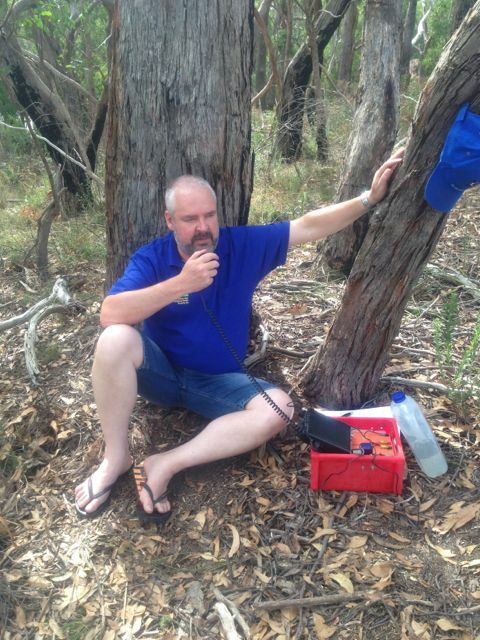 This was my first activation of Belair NP for 2014, so it was 2 extra activator points for the VK5 Parks Award. And I needed to try to get a few more QSO’s to head towards 44 for the global WWFF award. I have activated Belair NP previously and have talked about this beautiful park in other posts. 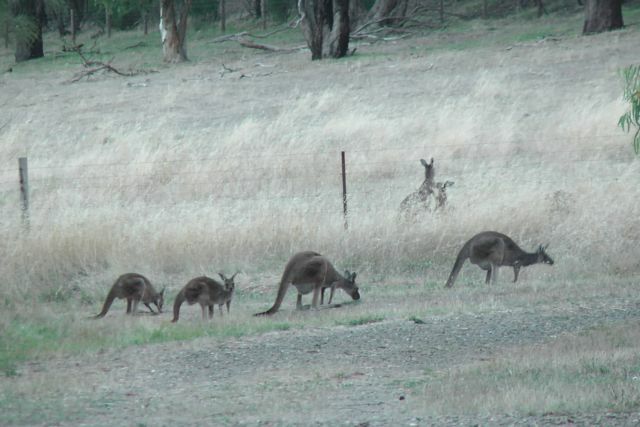 But very briefly, it is located about 13 km south east of Adelaide and is about 835 hectares in size. 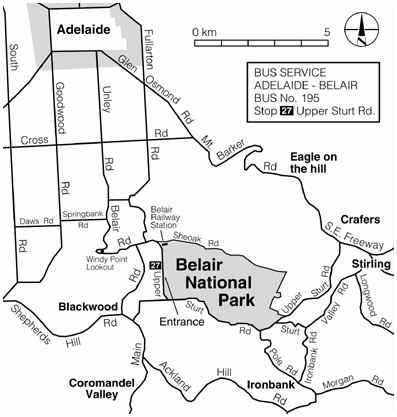 Belair NP was the first dedicated National Park in South Australia, having been established in 1891. About 250,000 visitors enjoy the park each year. My ever faithful wife Marija came along, who enjoyed a bush walk through the park, whilst I played on the radio. I set up near Pines Oval 2 just off Pines Oval Road. Marija became all sentimental, because this is where we had our engagement party years ago. Plenty of fond memories and lots of stories from that day which probably should not be mentioned here ! I set up my 40m/20m linked dipole on the top of the 7m squid pole, and for this activation I used by Yaesu FT-450, and ran 30 watts. Band conditions seemed extremely good, however, there were not many stations on the 40m band at all. My first contact was with Rod VK2ZRD who had a very strong 5/8 signal, with a 5/8 coming back to me. This was followed by one of the regulars, Col VK5HCF down in Mount Gambier (5/9 both ways). And then Nick VK3ANL called in with his QRP 5 watts with a nice 5/8 signal. I also worked Ian VK3VIN, and David VK5NQP. But the surprise call came from Neil VK8ZCU who was mobile 30 km south of Alice Springs with a very nice 5/7 signal from his mobile. I kept calling CQ for a while but there were no takers, so I headed down to the Riverland Radio Group Net where I spoke with Ron VK5BRL and a further 7 stations, including Col VK5FCDL/2. 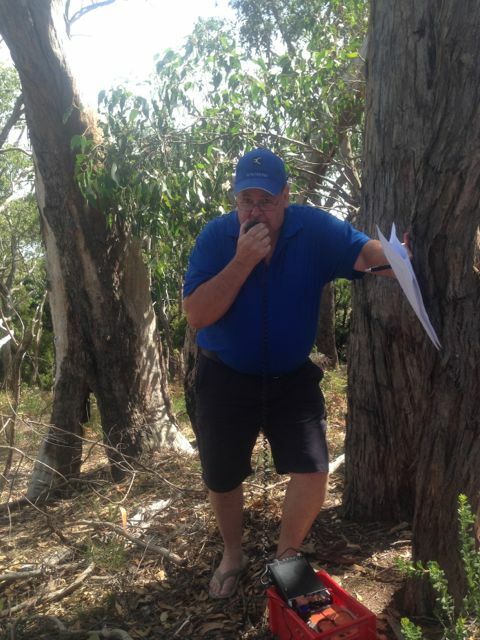 After the UTC rollover I headed to 7.095 and called CQ and was called by Roy (VK5NRG) who was operating VK5BAR at the Adelaide Hills Amateur Radio Society clubrooms at nearby Blackwood. This was followed by some of the regular Park Hunters including Nev VK5WG, Tim VK5AV, Bernard VK3AMB/m, and Don VK5NFB. New to the park’s log was Murray VK5BWA. Things really slowed down on 40m, so I headed over to 20m and called CQ for about 5 minutes but there were absolutely no takers. I think this is due to the fact that we have no audible alert system for the parks, like SOTAGoat and Rucksack Radio. This is something we really need to work on. So I tuned across the band and heard quite a few USA guys but their signals were down a bit so I didn’t bother calling. But I did find John VK5TD calling CQ who was incredibly strong, so I had a chat with him. I then worked felix VK4FUQ in Ingham in Queensland with a beautiful 5/9 signal, and then Ron VK6KRC who was a good 5/7 into Belair NP. After about 90 minutes in the park, it was time to pack up. I had a total of 24 QSO’s in the log. Rod VK2ZRD; Col VK5HCF; Nick VK3ANL; Ian VK3VIN; Neil VK8ZCU/m; David VK5NQP; Ron VK5BRL; Grant VK5VGC; John VK5NJ; Dennis VK5LDM; Tim VK5AV; Daniel VK5DF; Col VK5FCDL/2; and Keith VK5ND. Roy VK5BAR; Roy VK5NRG; Nev VK5WG; Tim VK5AV; Murray VK5BWA; Bernard VK3AMB/m; Don VK5NFB; John VK5TD; Felix VK4FUQ; and Ron VK6KRC.